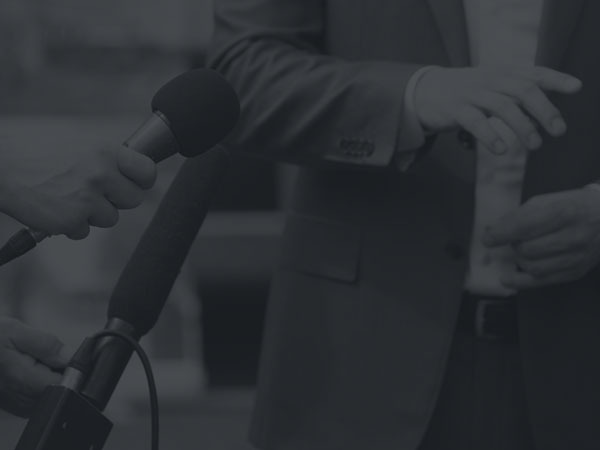 What’s In the Approved Fiscal Year 2019 Budget for Employment and Training? Workforce development funding decreases slightly, from $78.2 million in FY 2018 to $75.59 million. The approved FY 2019 budget continues to make investments in four subsidized job training programs, with funds totaling $37.5 million. DOES continues to underspend, but less than in prior years. The Infrastructure Academy will cost $9.25 million less than expected, due to large cuts to capital costs. $5.6 million in funding will allow the Paid Family Leave Program to move forward. The approved budget maintains $2 million in funding for transportation subsidies to adult learners. The Department of Employment Services (DOES) is a major source of job search, training, and placement programs for unemployed or underemployed adult District residents, as well as for DC youth. The fiscal year (FY) 2019 budget allocates $75.6 million for workforce development within DOES (Table 1). This is about $1.8 million less than the FY 2018 budget, after adjusting for inflation. 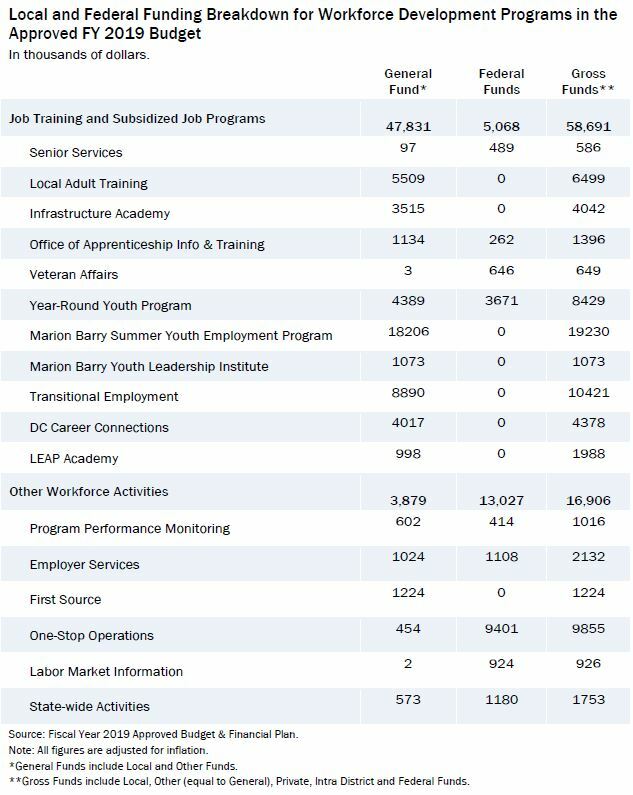 The approved FY 2019 budget continues to make investments in four subsidized job training programs: The Mayor Marion S. Barry Summer Youth Employment Program, the Transitional Employment Program, DC Career Connections, and the Learn Earn Advance Prosper (LEAP) Academy. 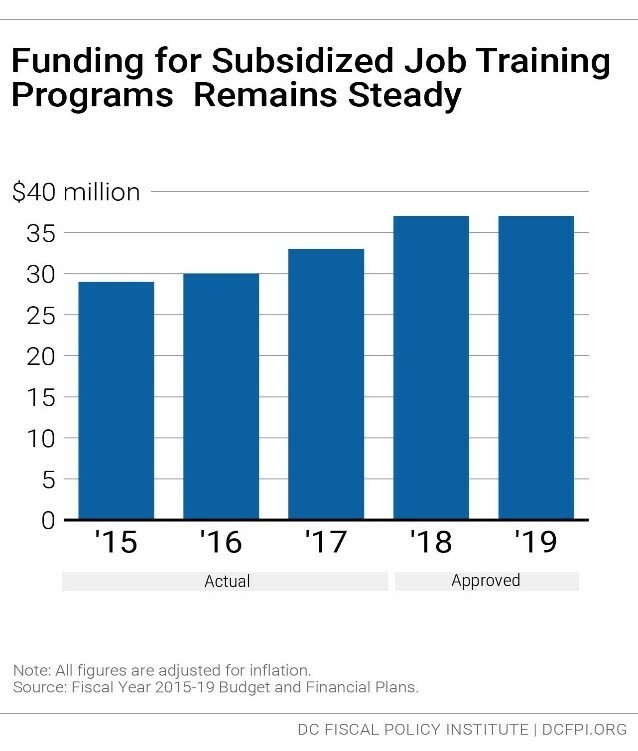 With the exception of LEAP Academy, the budget for subsidized job training programs increased slightly under the FY 2019 budget (Figure 1). In total, the budget allocates $37 million to subsidized job programs. MBSYEP is a locally funded program that provides District youth with summer work experiences through subsidized placements in the private and government sectors. Last year an expansion of eligibility through age 24 (from the prior age limit of 21) was approved. 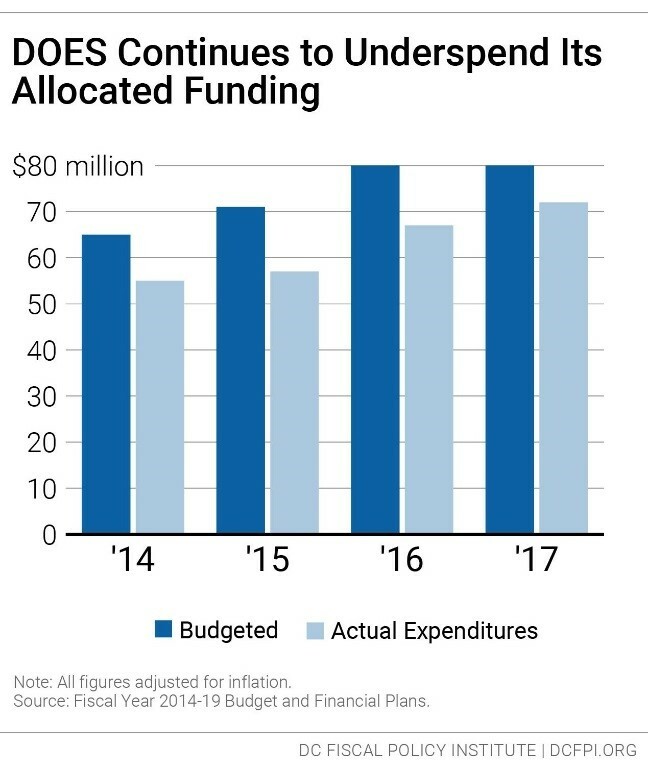 The approved budget increases funding slightly, from $20.1 million in FY 2018 to $20.3 in FY 2019, when adjusted for inflation. Total funding for MBSYEP includes the Marion Barry Summer Youth Employment Program and the Marion Barry Youth Leaders Institute. 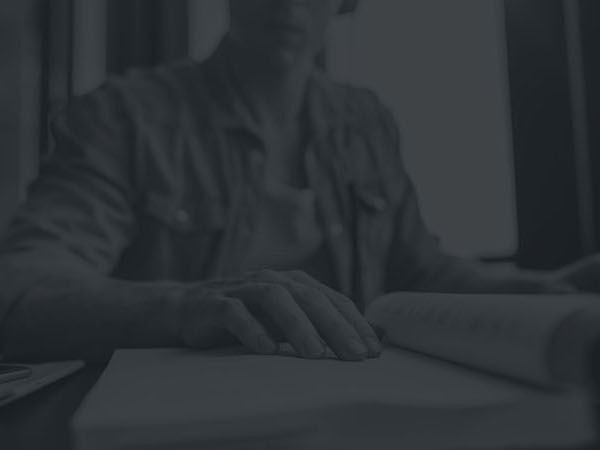 The Transitional Employment Program (also called Project Empowerment) is a subsidized job program specifically targeted to returning citizens and others with high barriers to employment. The program also provides supportive services, with the goal of helping participants secure permanent, unsubsidized employment. In FY 2017, about 200 participants were placed at 28 subsidized Work Experience (WEX) sites that also offered occupational skills training. The budget provides $10.4 million in funding for FY 2019, little change from FY 2018 after adjusting for inflation. DC-CC is a work readiness program started in FY 2017, specifically targeted to youth aged 20 to 24. It provides up to nine months and 40 hours per week of work experience, skills training, and individualized coaching and support for employment. The program served 320 youth in FY 2017. Seventy-four percent of participants who obtained employment retained it two quarters after completing the program. The budget provides small changes to funding levels, $4.38 million in FY 2019, as compared to $4.59 million in FY 2018 (when adjusted for inflation). The LEAP program was started in 2016 as a training and subsidized employment program for jobs in DC government and is specifically targeted to long-term TANF recipients. The approved FY 2019 budget provides $1.98 million in funding to the LEAP Academy, about the same as in FY 2018. The FY 2019 budget includes $4 million in operating funds for the new “Washington DC Infrastructure Academy,” which will provide job training in the infrastructure industry, including the utility, energy efficiency, transportation, and logistics sectors. The goal is to provide training to underserved District residents for jobs in high demand industries. The budget also changed plans to build a new facility and instead will place the Infrastructure Academy at the former Wilkinson Elementary School in Southeast DC. The budget allocates $7.5 million in capital money through FY 2024 for the Infrastructure Academy facility, a $9.25 million decrease from the previous year’s approved capital budget because of this change in plans. The budget also includes funding for staff and transportation costs for jobseekers. 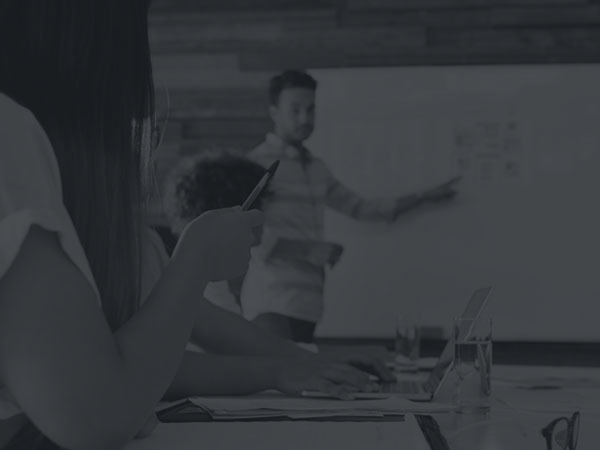 The Career Pathways Innovation Fund (CPIF) was created in FY 2016 to issue grants to design, pilot, and scale best practices in the implementation of adult career pathways and improve performance as mandated by the Workforce Innovation and Opportunity Act. The Workforce Investment Council (WIC) was allocated $500,000 in FY 2016 and $1.5 million per year in FY 2017 for the CPIF. It is unclear how much of this funding remains. The FY 2019 budget maintains previous levels of funding and provides $1.5 million to the fund. In December 2016, the DC Council passed the Universal Paid Leave Act (UPLA), which will provide eight weeks of paid leave for new parents to be with their children, six weeks to workers who need to care for an ill relative, and two weeks for workers to address their own health needs, beginning in 2020. The approved budget provides $5.04 million for paid family leave implementation and $40 million in capital costs through 2023, with $23 million in funding for FY 2019. This funding will allow the paid leave program to move forward—eventually it will be self-funded through a payroll tax. Benefits from the program will allow private sector workers to be compensated for lost wages when taking time off to care for a new child, an ill family member or their own serious health conditions. Last year’s budget funded $2 million in transportation assistance to adults in education and training programs. This is an important investment, because the cost of transportation has been identified as a major barrier to participation. Currently, the District Department of Transportation (DDOT) and the Deputy Mayor for Education (DME) manage the pilot and provide $50 per month for Metrobus and Metrorail rides to students in publicly-funded adult education programs. The budget maintains this funding in FY 2019 through DDOT. DOES has spent less than its available funding in recent years, raising concerns about its ability to meet the needs of unemployed and underemployed residents. 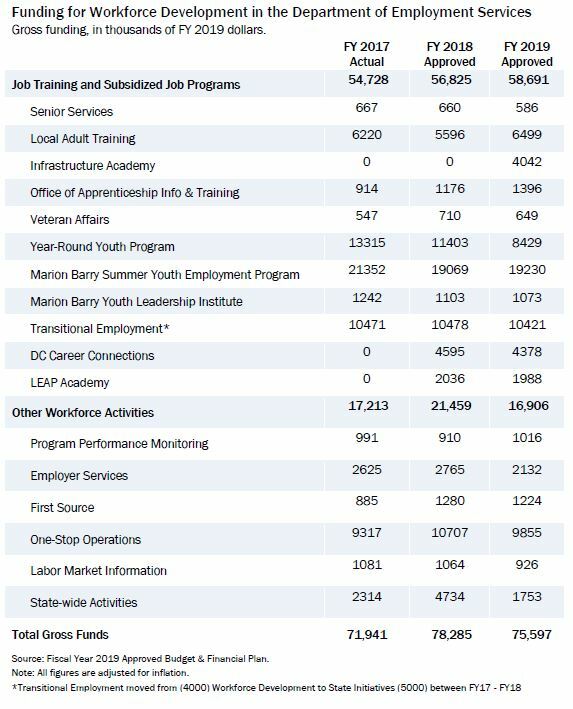 In FY 2016, the Department spent $65 million on employment services, compared with $78 million in available funding (Figure 2). In FY 2017, DOES spent $72 million on employment services and budgeted for $80 million. This is a significant improvement. All figures have been adjusted for inflation. The high unemployment rate among residents without a college degree points to great needs for employment assistance. In 2016, some 15 percent of DC residents without a high school degree, and 16 percent of those with a high school degree, were unemployed, as compared with just 2.7 percent of residents with a college degree. The agency should continue to reduce its levels of underspending to support comprehensive employment services. A number of other DC agencies support workforce development services, such as the Department of Human Services, Department on Disability Services, Department of Youth Rehabilitation Services, Office on Aging, and others. Many of these agencies do not isolate workforce development funding in their budgets, however. DOES Oversight Responses, Attachment 30, 2018. DOES Oversight Responses, #92 , 2018. According to learner listening sessions conducted in 2015 by the DC Adult and Family Literacy Coalition (AFLC) and Fair Budget Coalition. In addition, over a third of 1,000 adult learners surveyed in 2016 by the DC AFLC reported their biggest transportation concern is its cost. Lassiter, L. 2017. “Still Looking for Work: Unemployment in DC Highlights Racial Inequity.” Washington, DC: DC Fiscal Policy Institute.